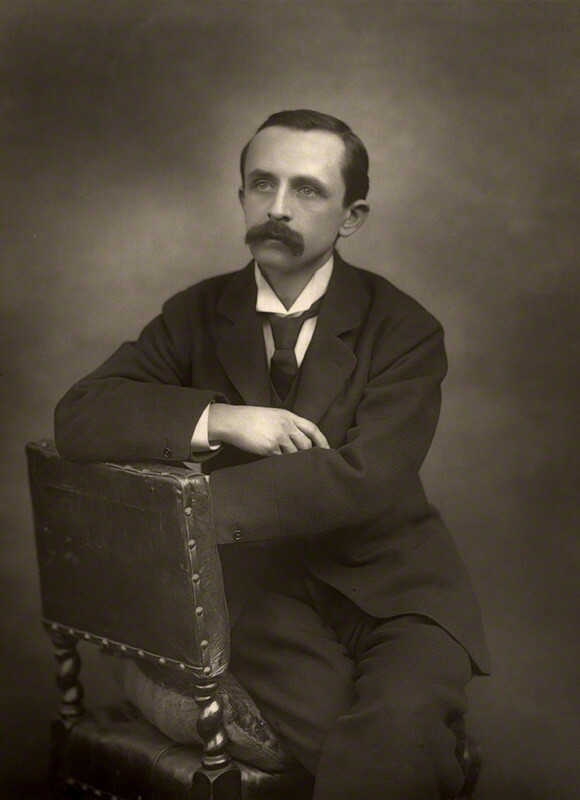 James Matthew Barrie was born on May 9, 1860 and was no stranger to tragedy throughout his life. When Barrie was six years old, his older brother David died in a skating accident, an accident that haunted Barrie for the rest of his life, and his mother never fully recovered from the trauma. Barrie had a love for the theater, and was a prolific writer of plays. Two years after his first commercial theatrical success in 1892, he married Mary Ansell, an actress who had performed a leading role in the play. Later he went on to publish novels and a memoir about his mother. Barrie became good friends with George and Sylvia Llewelyn Davies and their sons George and Jack in 1897, and his playacting with the boys was the principal source of material for his play Peter Pan, which also developed as a novel, Peter and Wendy that is now known as Peter Pan. Barrie and his wife divorced in 1909, but in 1910, Sylvia Llewelyn Davies died, and because her husband had died in 1907, Barrie adopted all five of their sons. But in the midst of this joy, pain was still to come. George, the oldest boy was killed in World War I. Several years later, the fourth of the Llewelyn Davies boys drowned while swimming in a millpond with a friend. Barrie never recovered from the death, and his writing pretty much ceased after this. Barrie’s last play, which reflected aspects of his life, including the death of his brother was not successful. He died in 1937. Despite all of this tragedy, J. M. Barrie has created one of the most beloved pieces of children’s literature of all time, filled with fantasy, delight and humor. But as the quote above mentions, it is tinged with some sadness. Nonetheless, I look forward to our journey to Neverland this month with Wendy, John, Michael, Peter Pan and Tinkerbell as we meet Tiger Lily, the Lost Boys and pirates and battle the evil Captain Hook. Let’s all be kids for a while and enjoy this time to “fly”. See you at Paradise Bakery and Cafe on May 12 at 7 as we discuss Peter Pan!